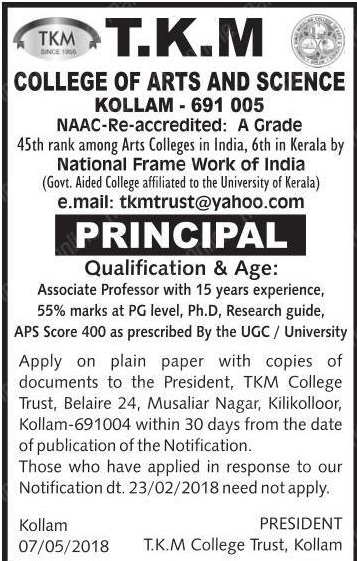 T.K.M.College of Arts and Science, Kollam has advertised in Malayala Manorama newspaper for the recruitment of Principal jobs vacancies. Interested and eligible job aspirants are requested to apply with in 30 days. Check out further more details below. About College: T.K.M. College of Arts and Science, established in 1965 by the TKM College Trust, is an acclaimed citadel of learning in the city of Kollam. Re-accredited by NAAC in 2013 with an ‘A’ Grade, which bears testimony to its potential for excellence, the institution today commands an unparalleled prestige in the academic community.